In 1998 I became independent. As I work usually at my clients side, I have invested a lot in computers, yet almost nothing in my local office. I bought a desk from IKEA and used some second hand desk I got from friends & family. I was not sure about standing, I’m not as young as I was when I was DJ-ing all night. Then I came across the idea of a walking desk. The idea, is that you walk about 1.6 miles (2.4 km) an hour, while working. The theory behind, is that our body is more made to walk then to sit still. The minute I saw this, I was immediately sold. That is what I wanted in my home office. When we started to discuss the plans of new house, I mentioned that to my architect. At that moment I was convinced that I should first have my new office and only then invest in a walking desk. Fast forward to the moment I saw the blog post from Peter. Peter is the ceo of Leanpub, the company behind the tools we used to produce our book: who is agile. When I saw the video, it struck me. I was doing BDUF. I was designing an office for a walking desk, without knowing how it worked. I told Els (my wife) the same day, I’m going to buy the walking desk now. With that experience I will know how I should arrange my new office. 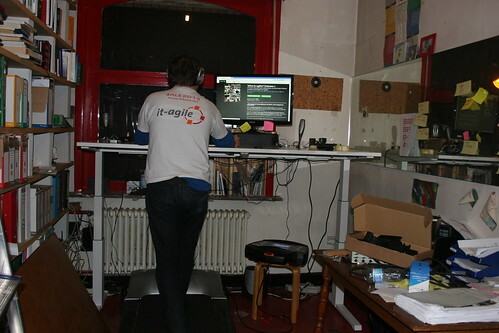 At the start of the x-mas holiday I went looking for a treadmill in Belgium that I could use in my office. In the US, there is treaddesk. Unfortunately no information to buy it in Belgium. As I had never run on a treadmill (yes, I am ashamed to say, that in all my staying in hotels, I never made use of these facilities.) I did want to go to shop to try out the different types. Peter his second video, convinced me I also wanted an adjustable desk. I wanted such a desk, so that I can both walk and sit at the same desk, without having to touch my setup. I only found one company (Steelcase) that delivers such a desk in Belgium. After almost 2 months of working on my initial setup (2 normal tables on top of each other) my adjustable desk arrived. Already now, I know that this is how I want to work. What about typing and mouse movements? A lot of people ask me if I can really type or work with a mouse that way. Check out our 2013 new years video. I finished the last 2 minutes while walking. And that was in the first week of having my treadmill. This text has been typed while walking. If you might see spelling mistakes, this has more to do with my knowledge of English then the walking desk. Actually, the last month I sometimes felt I had a problem standing. And then I realize I had been standing for 10 minutes and I had forgotten to turn on the treadmill. Remember these “I will be 5 minutes at my computer and then you look up 3 hours later” moments? I typically don’t turn on my treadmill for that. Now after 10 minutes I realize it’s taking longer. And then I make a conscious decision: stay on my desk and turn on my treadmill or actually stop working. Here are some pictures of the walking desk in multiple setup’s. Do you really move more? I have a Fitbit One stepcounter since the 24 December. Since then I stepped 800.858 steps. Yes not all these steps our on my treadmill desk. I still walk while waiting for my train. Yet I know that before I had a walking desk. I NEVER arrived at 10.000 steps a day. Now I am almost never below 10.000. Side effect: I never was a runner. I never had either: the energy, the courage and the times I tried it, I never had the physical condition. Since I have my walking desk, my condition has improved so much that it’s actually possible for me to go for a run. It’s NOT my intention to loose weight. As a adult I’m weighting +80 KG. In both occasion, people were telling me I should watch my weight. They told me I had an unhealthy weight. In both occasion they had reasons. I have stopped listening to these people. I don’t care about my weight. So why do I walk while working? I walk at my desk, because I’m convinced that my human body is not made to sit, at least not for + 8 hours a day. Articles like this one confirm my bias. a monitor arm to easier position my screen. I know that DKN has an tablet app. It would be nice to find one that supports the T830. Now the treadmill display is below my desk. Not a big problem, yet a little annoying. Could Desk Breaks Provide an Office Health Breakthrough? 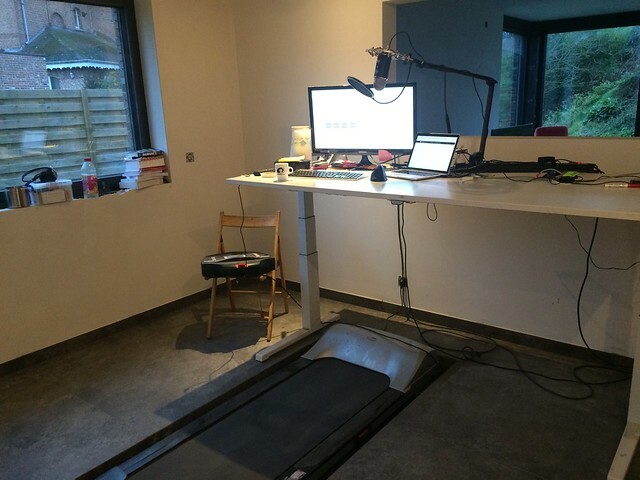 Is It Better to Walk, Run or Treadmill Desk? If you have a fitbit yourself, you can connect with me, and we can encouraging, stimulate, push eachother to keep stepping. Congratulations on your journey to reawakening your Human Animal – who deserves to become AGILE FOR REAL again. One STEP (pun intended) at a time. As I tweeted, walking, running, is a “call from our old horde from the savana”. Yves, thank you for coming to my blog (WhatIFoundOut.com) about my DYI Walking Desk and helping me find yours. I have really enjoyed reading about your experience too! I also found the yoga YouTube video about stretching your lower back in the comments on this post. Just what I needed! I’m going to watch it and try it out. When you start looking for your monitor arms let me know. I’d be glad to share What I Found Out about them and my use of them. yes please share your info on the monitor arms. Although it might be too early for me, I’m sure some of my readers might want it. I have thought of this in a slightly different way. A cycling desk. Putting parts of a hometrainer underneath the desk. (could even power the desklight or pc fans). I haven’t tried it out yet, so dont know if it’s comfortable to work on. I’m always moving at my desk even when I sit in my chair. Could better put it to use with walking or cycling. I need to have the walking desk that sets my speed. Generating the power would not work for me. A bike would probably not work for me. Walking gives me a lot of freedom. vraagje voor de ervaringsdeskundige bij uitstek: voldoet een elementaire loopband van DKN (in combinatie met een zit/sta-tafel van een ergobedrijfje)? ik kan enkel spreken over wat ik heb. ik ben geen andere setup gewoon. Van mijn setup ben ik zeer tevreden. Ik vind het wel belangrijk dat ik de snelheid kan aanpassen. In Amerika heb je walking desks met min of meer fixed speed, dat zou niet werken voor mij. Gisteren heb ik 1 uur vergaderd als stappend. (via skype) en ik heb de band p 4 km per uur gezet. Uiteraard toen ik nadien wat ging schrijven, heb ik het terug op 2,6 km gezet. Ivm de bureau, voor mij is het noodzakelijk dat de hoogte kan versteld worden door een druk op de knop. heel regelmatig pas ik de hoogte aan als ik bvb wel of geen schoenen aan heb. Dat gaat over een centimeter of zo, maar het gebruiks gemak is zalig. Sommige ergonomische bureaus zijn mechanisch verstelbaar. En darvan zijn er veel met vaste tussen hoogtes. dat zou niet werken voor mij. + hoe verstel je die dan, moet ik onder mijn bureau kruipen (aka boven mijn loopband?) nee dank je. Het was een serieuze investering, en ik ben blij dat ik ze gedaan heb.